Agriculture is the cornerstone of Ventura County’s economy that supports thousands of jobs throughout our region. It is also a proud part of our heritage, giving our community its unique beauty. In Congress, I have worked hard to support our local agricultural producers, workers, and businesses. Today, Congresswoman Julia Brownley (D-Westlake Village) announced that she and a bipartisan group of Members from the California delegation have called on the U.S. Department of Agriculture (USDA) to accelerate efforts to help California Hass avocados gain market access in China. California’s 2,000 avocado farmers produce over 90 percent of the total U.S. avocado crop, yet they have not gained the same level of access to China as competing countries. The letter calls on the Trump Administration to prioritize a California avocado trade agreement as part of upcoming trade negotiations with China. Today, Congresswoman Julia Brownley (D-Westlake Village) announced that San Miguel Produce, based in Oxnard, will receive $250,000 in federal grant funding from the U.S. Department of Agriculture (USDA) to help create jobs in Ventura County and support California’s leafy green growers. Despite their importance, producers of the crop tend to be overlooked, said Rep. Julia Brownley, who toured Sun Valley Group’s Oxnard farm earlier this month. 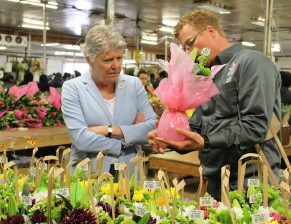 Brownley, D-Westlake Village, decided to tour the farm due to the importance of Mother’s Day to the industry and to raise awareness of the crop. 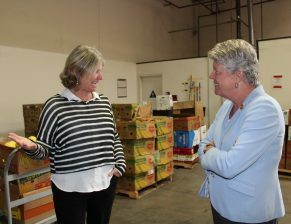 Today, Congresswoman Julia Brownley (D-CA) visited FOOD Share in Oxnard to discuss the local food bank’s role in addressing food insecurity here in Ventura County. FOOD Share serves 74,500 people every month and distributes 11 million pounds of food annually. Why did Trump sour on lemon ban? Congresswoman Julia Brownley issued a statement in response to the Trump Administration’s announcement that it was moving forward with a rule to allow Argentine lemon’s to be imported into the United States. Rep. Julia Brownley released a statement in response to President Donald Trump and Argentine President Mauricio Macri’s press conference today at the White House. Today, Congresswoman Julia Brownley (D-Westlake Village) announced that The Abundant Table in Oxnard will receive nearly $100,000 from the U.S. Department of Agriculture (USDA) to increase access to locally-grown produce for low-income communities throughout Ventura County. 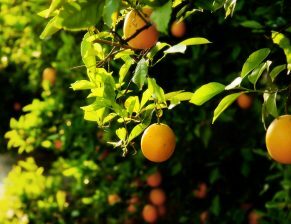 Congresswoman Julia Brownley (D-Westlake Village) welcomed the announcement that the U.S. Department of Agriculture (USDA) has made approximately $66 million in Specialty Crop Block Grants available for projects to help specialty crop growers. As a member of the Specialty Crop Caucus, Brownley fought for the renewal of the Specialty Crop Block Grant program when Congress reauthorized the Farm Bill. Because of agriculture, Ventura County has a unique beauty, heritage, community and economy — but our community depends on reliable access to fresh water. Without it, our rivers dry up and our crops cannot grow. Today Representative Julia Brownley (D-Westlake Village) voted against the More Hunger, Less Opportunity Act (H.R. 3102), which would slash nearly $40 billion from the Supplemental Nutrition Assistance Program (SNAP), a program that primarily helps feed children, seniors, the disabled, and our veterans.